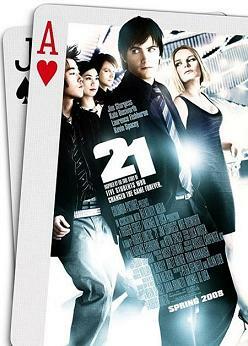 The film may not imitate the actual real-life story, but 21’s style imitates the card counting method it chronicles, and is an example of how a deck can go from good to bad to mediocre every few cards. At one moment, the movie is +12, moves down to -1, bumps up to a +5, and in the last half hour, jumps up to +16 (it’s card counting lingo). What a crazy shoe (set of decks). 21 has a bumpy 90 minutes, but is also an example of how a pitch-perfect finale can redeem an entire movie. The film is inspired by the book “Bringing Down the House” by Ben Mezrich. If you’ve read the book, and enjoyed it (how could you not?) then don’t go into 21 expecting an experience half as fun, sophisticated or intelligent. The film abandons the plot of the book almost entirely; it uses a very simplified version of the card-counting method the book’s MIT team used, but the similarities end there. I knew this going into the movie, and I tried very hard to simply forget the book and have a good time. Surprise of all surprises, this actually worked for me….mostly. I didn’t mind most of the plot changes, but I didn’t like the way they simplified the team and the methods for the film. In the book, for instance, the team is much bigger and has three levels of players; spotters, gorillas and big players. The film omits the gorillas, and whittles the team down to five players (changing their nationality to boot). The over-simplification is hard to ignore for anyone who has read the book, and I wish they could have stuck with the book on this one. There are other little gripes with the ‘adaptation’ that I won’t waste your time with. “Bringing Down the House” is an incredibly fun, well-written, and very smart read. The basic point is that 21 does not stick with this great book, but the results are better than expected. Getting past the over-simplification of the rules, the film’s first 90 minutes or so (henceforth referred to as Acts 1 and 2) are rather uneven. Jim Sturgess (last seen giving a great performance as Jude in Across the Universe) is endearing as Ben, and is a convincing lead. He plays the character way too timid though; if you walked through airport security with sweat all over you and hesitating with every action while having 250,000 dollars in cash stuffed in your pants, you would get caught. I think this might be the writing and directing more than the acting, though. Whoever’s fault it is, his timidness takes away some of the believability in the first two acts. There’s some truly great moments here and there, like the scene where Ben answers some tough questions in professor Rosa’s class, but overall, the film’s first two acts are unevenly paced and filled with scenes that range from good to mediocre to silly. But in the film’s third act, the movie pushes all its chips into the pot and hits blackjack. Then the fun really begins. I don’t want to spoil anything, but the film’s last half-hour is full of great twists and an ending that will leave you with a great big smile. It’s truly ingenious. I respect the last act even more because it doesn’t leave everything happy and fun; the characters don’t all move into penthouses, and the ending isn’t 100 percent happy. That’s something you don’t see in mainstream cinema very often, and I applaud the writers for this. I just wish the same care and creativity could have extended into the film’s first two acts, because, even though it’s different in the book, this could have been classic. The acting is fairly solid across the board. As I said above, Jim Sturgess is a strong lead. Of British origin, he uses a convincing American accent; his British accent sneaks in once or twice, but he’s a solid lead. Kate Bosworth plays Jill Taylor, another member of the team; Bosworth is as convincing in this role as she is ugly (an insult and a complement in the same sentence; not bad). Kevin Spacey more or less steals the show as Mickey Rosa, and Lawrence Fishburne proves that he was born to play a security guard with giant fists. 21 doesn’t capture the fun of Vegas in ways that Ocean’s Eleven-type movies do, but for what it is, 21 is a fun little film. If you’ve read the book, this is probably one of those movies you should rent; it’s hard to get over some of the glaring inaccuracies. But taken as a separate entity, 21 is a fun caper. Sadly, it loses so much money in the first two acts that when it hits Blackjack at the end, there’s not too much left to bet. The resulting win is a respectable amount of money that could have been much bigger if they hit 21 earlier. Believe it or not, those blackjack metaphors are harder to come up with than one would think.